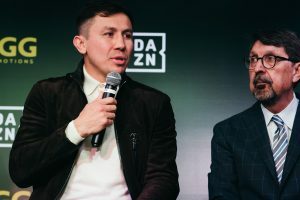 Middleweight powerhouse Gennady Golovkin recently signed a highly publicized and lucrative deal with DAZN streaming service. The deal meant that the former titlist would now be fighting under the same broadcast banner as fellow division elites Canelo Alvarez, Daniel Jacobs and Demetrius Andrade. Some immediately assumed that a third fight with arch rival Canelo would subsequently be right around the corner. Yet Canelo surprised a few people during a Tuesday conference call when he indicated he’d only be willing to face Golovkin for a major belt – something Golovkin no longer has thanks to some controversial judging during his last fight with Canelo. In an exclusive videotaped interview with Boxing Insider, Golovkin’s longtime promoter, K2 Promotions honcho Tom Loeffler further raised eyebrows by making it clear that Golovkin may still very well be one of the most avoided fighters in the world. Speaking from Gallagher’s Steak House in New York City in the leadup to Saturday’s Christina Hammer-Claressa Shields women’s middleweight superbout, Loeffler claimed that Golovkin “ took some time off. He had so many offers from television companies.” The promoter then said that getting top competition for his fighter was still a hassle, which means things were much as they had been before Golovkin was able to get Canelo in the ring for their two highly debated bouts. “That’s the one thing we couldn’t accomplish with GGG,” Loeffler said, “even though I thought he would be the easiest one to go after all the champions. We made offers two, three times what they had made their biggest payday before and he was willing to fly to their home countries to challenge for the title, to collect the titles.” Still, no one took team Golovkin up on its offer. Loeffler didn’t name names, but his statement will clearly have people guessing who the uninterested parties might be. Loeffler also weighed in on May’s much anticipated Canelo-Jacobs bout.